My kiddos will be starting school in one week! With C getting closer to her first day of Kindergarten, I am already brainstorming school lunch packing. 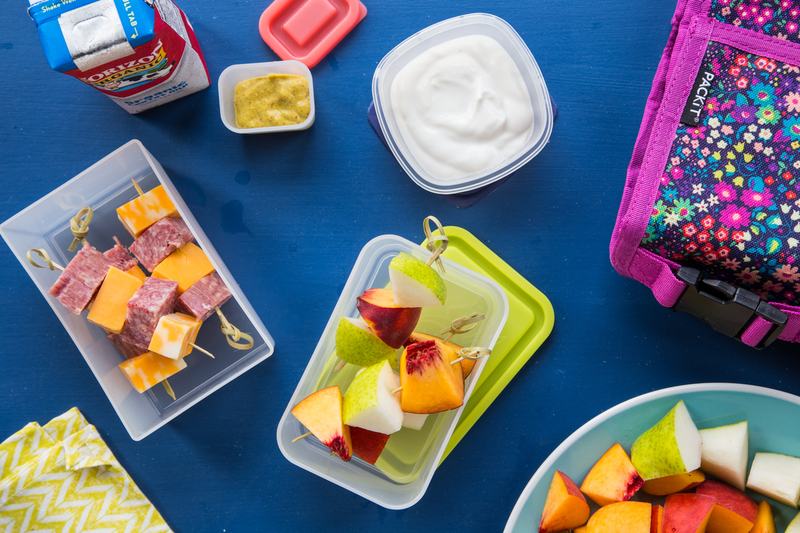 This post is sponsored by PackIt and features some of my very favorite (and simple) ways to make school lunches special. I have had practice over the last few years with kids going off to school. This year, A will be going into second grade and the years that he has been in full day school have helped prepare me for both kids being gone – and this is the year. Just like any big milestones, it’s bittersweet. Sadness that my baby is growing up so fast, but excitement to see her go off and be her independent little self. I will miss her little face eating lunch with me. I will be thinking of both my kiddos sitting at the school lunch table surrounded by their little friends and enjoying the food that I pack them from home. I love knowing that I can pack a special meal for them to enjoy, even when we aren’t together. When it comes to school lunches, I enjoy packing meals with love, but I’m not a fancy lunch packer. And while I’m not sculpting my daughter’s face out of a brick of cheddar, I do have a few simple tricks to make a packed lunch a little bit special. One of my kids’ favorite ways to enjoy their lunch is on a stick. 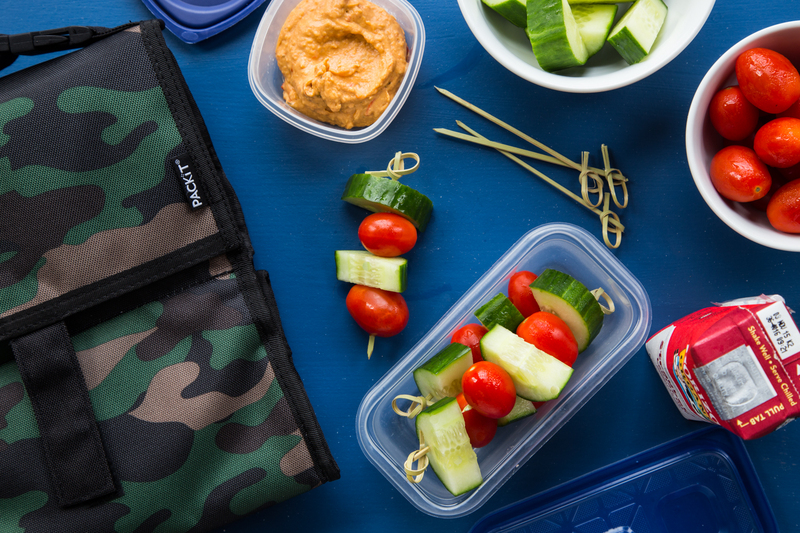 Lunchbox Kabobs are some of the easiest packable lunches that go slightly beyond the typical sandwich, but won’t have you stressing out over the daily task of lunch packing. For the fruit kabobs, I chunk up whatever type of fruit that I have on hand. This week it was peaches and these little green pears that were too cute to pass up at the grocery store. I found 4 inch long knotted skewers that work perfectly for these small lunchbox kabobs, plus they aren’t too sharp so there are no safety worries. I pop a few pieces of fruit onto each skewer and pack them into a small lidded container. A dish of vanilla Greek yogurt acts as the perfect dipper. Cubes of sharp cheddar and Monterey Jack cheese get skewered with chunks of salami. Serve these little protein skewers with a bit of mustard for a spicy kick. For the vegetable kabobs, use whatever is in your fridge. I typically have some sort of small tomato and a cucumber so that is what I went with. Cut the cucumbers in thick slices and then in half for very skewer-able bites. Pack a dish of hummus for the perfect dip-able side. Now, my focus on lunch packing does not end with the food. Having a great lunch bag to carry the food is key. 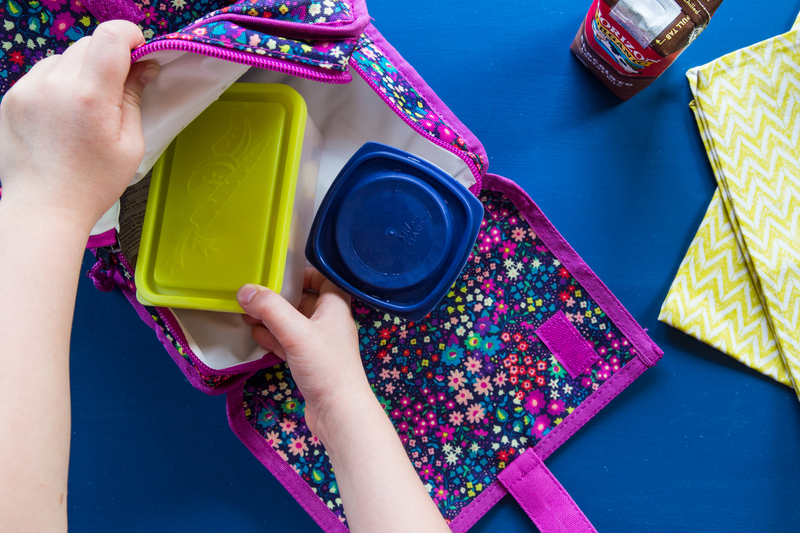 I have had a lot of trial and error with lunch boxes and bags so when PackIt asked if I wanted to give their freezable lunch bags a try, I was definitely interested. First things first, the prints are adorable. A chose the Freezable Lunch Bag in Camo and C chose the same bag in Bloom. I picked a slightly larger version, the Deluxe Lunch Bag, in Ziggy for when we go places as a family (car trips, picnics, camping) and need a little more room for me and my husband. 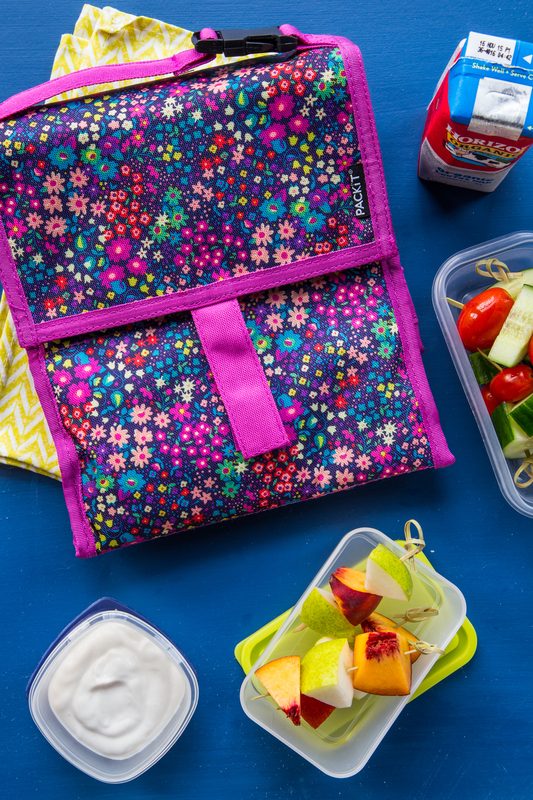 The classic Lunch Bag size is perfect for school age kids. The entire bag freezes! I’m talking you fold up the bag (takes up about the same amount of room as an ice pack in the freezer) and pop the entire thing into the freezer. This means that the walls of the bag act as the ice pack and I no longer need to fuss around with making room for an ice pack in the actual lunch bag. This is huge. Ice packs tend to take up a ton of valuable real estate in a lunch bag that could be better used for things like milk boxes and yogurts. Speaking of milk boxes and yogurts, let’s talk about how the PackIt’s do at keeping food cold. We used our Deluxe Lunch Bag on our most recent car trip and it not only kept our yogurts cold, but it actually chilled our milk boxes. I like to buy the shelf stable milk boxes that do not need to be refrigerated, but honestly, they taste better cold. I put a few un-chilled milk boxes in our frozen PackIt and by the time we opened it up to enjoy our snack, the milk boxes were cold! No more do I need to remember to put the milk boxes, juice boxes or water bottles into the fridge the night before – the PackIt will do the work for me. One other major point of importance is ease of use. With C being only 5, and while she has some great fine motor skills, I needed to make sure that this bag was not going to cause any delays or difficulties with opening. They have only 20 minutes at school to eat, so these precious minutes need not be wasted wrestling a lunch bag open. Both of my kiddos were able to open and close their PackIt with ease, which was also a huge plus. I am very happy with our new PackIt Lunch Bags and feel like it is our final check box in being ready to go back to school! The Giveaway has ended Thank you for entering! The winner will be contacted shortly. PackIt knows so many of us have families that are on the verge of heading back to school so they are offering 1 Jelly Toast reader the chance to win $100.00 toward their own family of PackIt Lunch Bags. Simply leave a comment on this blog post by Sunday, August 16th at 6:00pm EST for your chance to win $100.00 on PackIt.com. Giveaway is open to US residents only. One comment per reader, please. In addition to this great giveaway that is sure to get your family ready for school, PackIt is also offering a 15% off coupon code for all Jelly Toast readers on the PackIt.com website that is good through Saturday, August 15th. Simply enter the code JELLYTOAST15 at checkout to receive your discount. If you would rather purchase the bags in person, they are available at Bed Bath & Beyond, Target and other popular stores. Check out their website for a more complete store locator. Don’t forget to enter your comment below to enter yourself for a chance to win $100.00 on PackIt.com. Disclosure: This post and giveaway are sponsored by PackIt. Thank you for reading and supporting the brands that I love and that make Jelly Toast possible. Would love to win this! I pack lunch nearly every day of the school year and the fact that these bags are their own ice pack makes me feel better about packing things that would normally need to be refrigerated. PackIt makes such great products – thank you for hosting this giveaway. Robbie was watching me read this and said “I’ve always wanted a PackIt”. He needs a new lunch box, so thanks for the discount! Woot!! What a brilliant idea! And the print choices are super cute. I was just out finishing up our BTS shopping today. I love this time of year – not because I’m excited to send my kids off, on the contrary I miss them like crazy and wish I could home school – but because I love all the new crayons, pencils, folders, and lunch boxes. I had to laugh out loud when I read “sculpting faces into bricks of cheddar” because that’s not me either, haha. Though, I do pack all 3 of my kids lunches everyday and I try to do something special or extra for each one. And sometimes, the only little thing is a note telling them I miss them and to enjoy their day. This would be soooo awesome to win! My daughter is a college student and an EMT and I work in an office where we both bring snacks and lunch on the go. This would be totally helpful because we forget to eat most times and having this all together and prepared the night before would really help. And we would be fashionably cool! Looks like an awesome product for back to school! I love the cute pattern’s on these great lunch boxes. Great product. Kabobs are a great idea for lunches! And I love all the different patterns that PackIt has. These are so cute and such a great idea. Thanks for hosting the giveaway! They’re so cute! I’d love them for my sons school lunch! I can’t believe school is starting soon! I’m always struggling to find lunch boxes we like. These would be fantastic! I can’t believe it’s back to school next Monday, this is an awesome prize package, thanks for thinking of our kids! 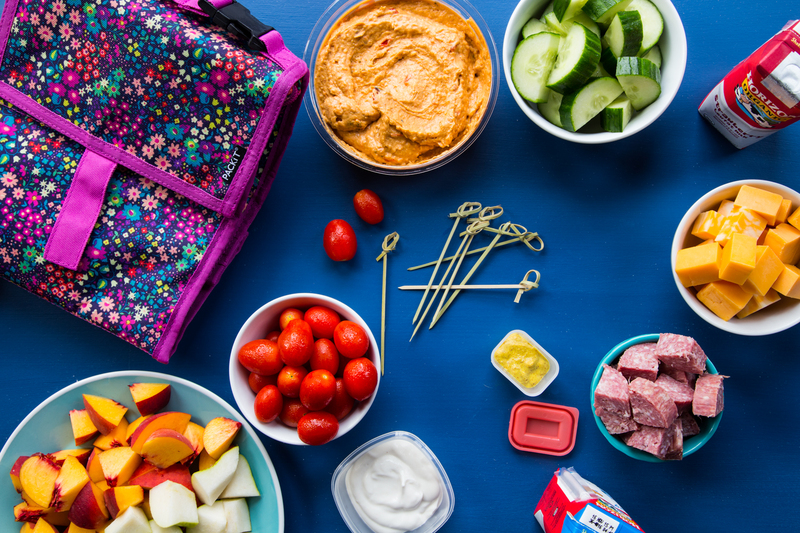 I never thought of packing kabobs in lunches – what a great idea! I’d love to try Packit’s Deluxe Lunch bag, and sandwich bags. I love how stylish these bags are! 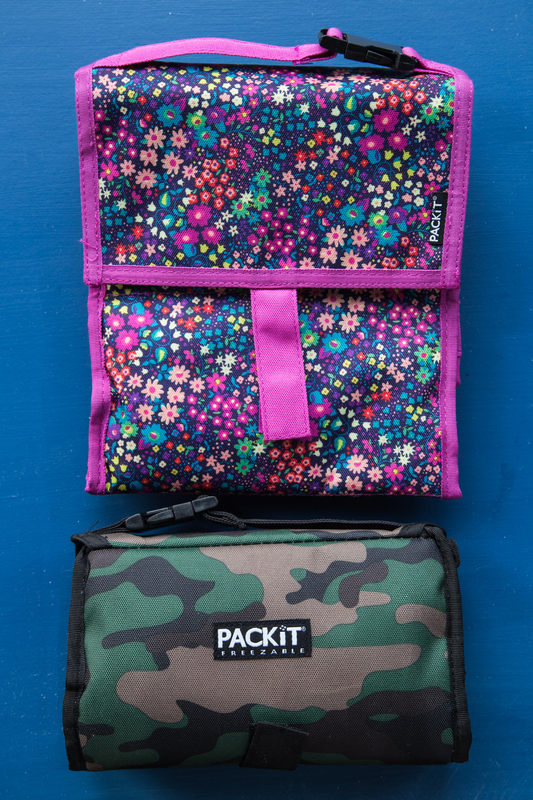 These bags are awesome.I pack lunches every morning so I love PackIt’s Freezable Deluxe Lunch Bag! Where did you find the skewers? I’m always leery about kabobs because I’m afraid one of my kids (guess which one) would get crazy with the skewers. But those look pretty harmless. I like the idea of kabobs because they look like you made an effort, but it isn’t actually more work than a sandwich, which is a win for everyone. These seem really useful because one doesn’t always have access to a fridge to keep lunch in. Plus the designs are absolutely adorable. Thanks for the chance to win. What a great giveaway! My favorite bag is the Picnic bag in the Vine print! I’m always struggling coming up with new ideas for lunch and haven’t thought of doing kabobs before. So I’ll have to try these out sometime. Awesome giveaway! Always looking for new lunch supplies!